Chapbooks don’t get enough attention. Only independent bookstores want to sell them, and sadly, such bookstores are disappearing faster than I can finish this sentence. Poets do their best to sell them at readings and book fairs but they’re a hard sell! Oldschoolers see chapbooks as the road leading to your first book. In the intro to Jim Smith’s Back Off, Assasin! well known Toronto poet Stuart Ross writes about how young poets don’t want to make their bones anymore; he refers to poets not wanting to produce chapbooks before coming out with a first collection. The critique is true of a lot of poets. Many poets today haven’t even published a poem and they get a book deal! Fooliar Press, a Toronto chapbook publisher puts out limited edition copies (50 to 100 of a chapbook) every year. 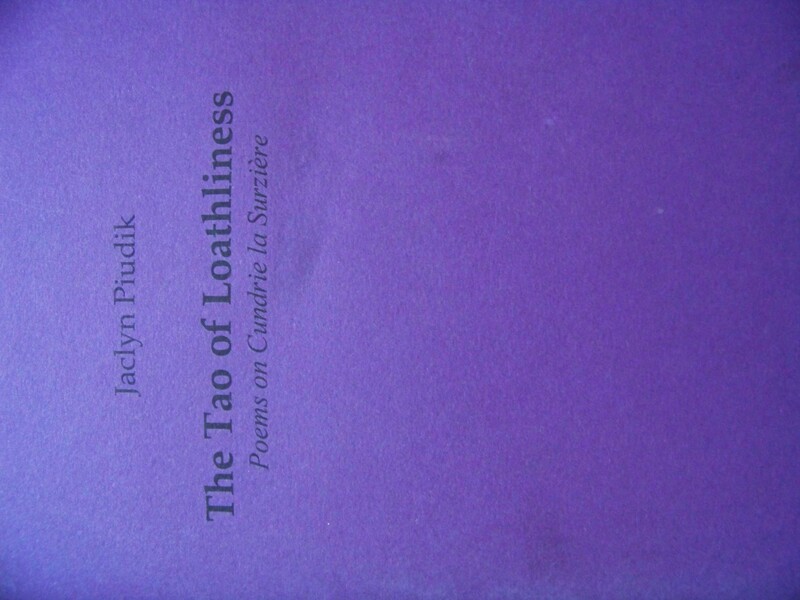 The Tao of Loathliness: Poems on Cundrie Surziere by Jaclyn Piudik is a beautiful chapbook filled with poems that explore different topics. If you don’t read the title carefully you’d think you were holding a new age self help book: The Tao of Loneliness. Loneliness may not be in the title but it is part of the book. Published in 2008, Piudik’s poems are printed on smooth, thick, gray paper and enveloped in burgundy, krinkly wrapping. The cover is purple, possible a metaphor for how deep you’ll go once opening the chapbook. Appearing in The Columbia Poetry Review of Columbia College Chicago, The New Quarterly, and the recent anthology Crave It by Red Claw Press, it is no surprise that Piudik shows style, craft, and experience in her writing. The title poem, The Tao of Loathliness, is heartfelt, refined, raw, philosophical, and a teaching. Piudik pulls you in with her first line: “I never knew my mother”. Mothers are so coveted you can’t help but read on and ask questions: Why? How? Piudik challenges black and white thinking, “Rules are broken for gluttony, they taught me”, and writes of her contemplating such views describing them as “leprous koans”. and she thought she’d prove them right. What is proven in The Tao of Loathliness is that chapbooks are still relevant and that Piudik is a great poet. With several publications and a chapbook to her name Pidiuk is ready to put out her first book; I can’t wait! Tune into Black CoffeePoet.com Wednesday August 31, 2011 for an interview with Jaclyn Piudik. This entry was posted in Poetry and tagged "Back Off Assasin" by Jim Smith, "The Tao of Loathliness" by Jaclyn Piudik, "Why She Ate Her Hair" by Jaclyn Piudik, Black Coffee Poet, fooliar press, https://blackcoffeepoet.com/, Jaclyn Piudik, Jorge Antonio Vallejos, Stuart Ross. Bookmark the permalink.